Investors in People Scotland (now Remarkable) assessed the Association against the wider Advanced Framework over two days during March. The review assessed how ng homes attracts, recruits, supports, guides, develops and retains young people and this involved assessor Alix Malcolm meeting with a number of young people and managers who have mentored and supported the young people at work. Tony Sweeney, ng homes depute director (corporate services), said: “We currently have the Investors in People Gold and Health & Wellbeing Awards and we have also had Investors in Young People recognition in place since 2016. At this time we felt ready to be assessed against the Advanced Framework and we are delighted that this has resulted in the IIYP Gold Award. Strengths highlighted include the organisation’s values being at the heart of its approach to supporting young people and the Association’s strong commitment to young people both externally across its communities and internally around the opportunities it offers. Other key strengths identified were its clear strategy for developing young people which includes; qualifications, on-the-job learning and mentoring, and managers who are seen as role models who are committed to developing young people. 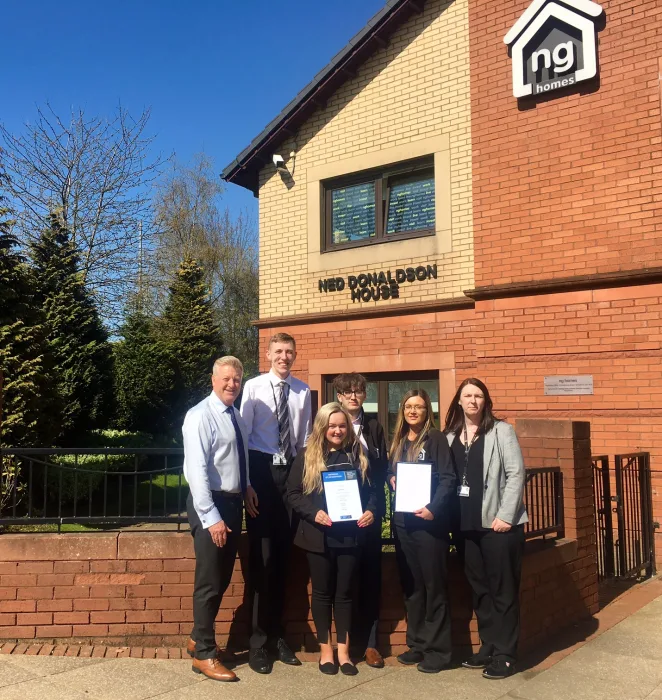 John Thorburn, ng homes chairperson, said: “Over the years we have been actively involved in recruiting and developing young people, many of whom have successfully completed traineeships and gained relevant formal qualifications along the way. We now have several young people employed in various roles across the ng group. The second generation IIYP Framework allows for measurement, benchmarking and progressions towards higher levels of accreditation. Each level detailed below clearly describes how well the practices are applied within an organisation. Stage 1 Understood:The appropriate principles and practices are in place and communicated. Young people and Leaders know what is expected of them. Stage 2 Embedded:Young people and Leaders are actively engaged in ensuring the appropriateness and consistency of the principles and practices. Stage 3 Lived: Young people and Leaders actively drive positive outcomes, taking ownership of the principles and practices.